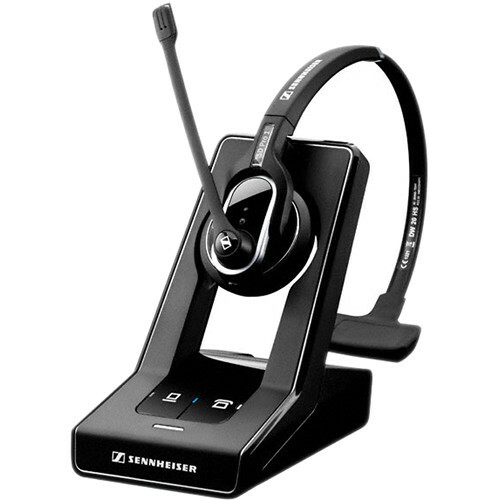 The SD Pro 1 ML Single Sided DECT 6.0 Wireless Headset from Sennheiser is a single-sided premium DECT wireless headset for desk phone and softphone. It features HD sound and voice clarity, a noise-cancelling microphone, and ActiveGard hearing protection technology. The headset is designed for business professionals who communicate via desk phone and Microsoft Lync. It comes with side support and a large, soft leatherette ear pad for comfort and balance on the head. In wideband mode, the headset can provide up to 8 hours of talk time, and up to 12 hours of talk time in narrowband mode. It is designed to operate at a range of up to 180' in a typical office setting. The SD Pro 1 has dual connectivity for both desk phone and softphone. You can switch from one communication source to another with a single touch on the base station. The headset is compatible with major global providers of telephony and Unified Communications platforms and solutions. The headset provides HD voice clarity for a natural wideband sound experience by delivering a warm and natural sound. HD sound allows you to catch the tone of your callers' voices, so that you can avoid misunderstandings in noisy environments. The headset features are intuitively designed to fit seamlessly into your daily workflow. Built-in call handling makes it simple to answer/end, mute or control volume while moving around the office. Features such as left/right wearing and name plate make it easy to personalize your headset. The walk and talk feature of the headset enables you to experience quality sound on the move, while walking around the office. It extends your working range so you're always in contact with your phone. In a typical office building this headset gives you a radius of up to 180', while the range in line of sight is up to 590'. The headset provides you with 8 hours of talk time in wideband and 12 hours in narrowband sound mode. With this feature you can work all day without interruptions. The SD Pro 1 is equipped with a noise-canceling microphone, which filters out background noise for crystal clear conversations. ActiveGard technology protects users from acoustic shock and sudden sound surges. The headset comes with side support and a large, soft leatherette ear pad for comfort and balance on the head. The headset's battery recharges 50% in 20 minutes and 100% in one hour. Box Dimensions (LxWxH) 6.535 x 6.457 x 6.299"